I have this cute little Pencil Sleeve project to share with you. These little sleeve’s can be used to hold colouring pencils, or can be adjusted to hold crayons, knitting needles or crochet hooks. I’m making some of these for the School Craft Stall but they’re also a great Back to School project or even an end of school year teacher gift. Take the small piece of fabric which will be the closure strip. Press in half along the shorter side. Open and fold each side to meet the centre fold line. Does that make sense? Here is the picture of what I’m trying to say. Fold in half at the previously pressed crease and top stitch it closed. Fuse the interfacing to the back of the outer fabric (in my case, it is the owl fabric). Fold over the fabric and place a pencil to measure where you need to add the closure strip. As you can see in the photo, mine is approximately 1.5” from the raw edge. Pin and sew it to the outer fabric – about 1/8” from the edge. I went over mine a couple of times to ensure strength. Trim the excess on either side, so that it aligns with the owl fabric. Place the lining fabric on top of the outer fabric with right sides together. Sew all around with a 1/4” seam, leaving a gap for turning out. Turn out and poke out the corners so you have lovely sharp points. Fold in the open seam edges and press. 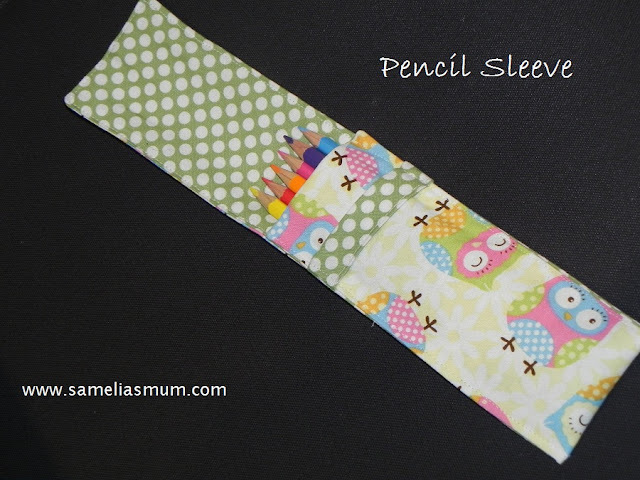 Fold the Pencil Sleeve – to be sure of placement, get your pencil out again and put it inside the sleeve. Pin in place and top stitch along both sides (which will now secure the open seam) and the top. Insert some pencils and it’s ready to go. Add a Barbie colouring book and I have a very happy little girl. If you make a Pencil Sleeve, I’d love to see it. Send me a photo or add your project to the Samelia’s Mum Flickr Gallery. Looks like an easy project, adding it to my list :) Thanks for the tut! A very cute little project. Thank you so much for sharing. Your little pencil holder is just too cute. TFS. this is so cute! I have never seen one with space for paper, but that is brilliant! Just did two of these for my daughters using their school uniform fabric. They really enjoyed them. Thanks for the tutorial. I just made two of these for my daughters in their uniform fabric. They were excited about them. Thanks for the tutorial.